This beautifully upholstered leather visitors chair features thickly padded dacron-filled seat and back cushions, integrated molded loop arms and a sturdy tubular steel sled base painted in gloss black. This chair meets and/or exceeds ANSI/BIFMA standards. Dimensions: Seat: 20"W x 20"D. Back: 22"W x 22"H. Seat height 20.5"H. Fully warranted by Boss Office Products. This elegant visitor chair compliments our B9701 Boss high back leather office chair. 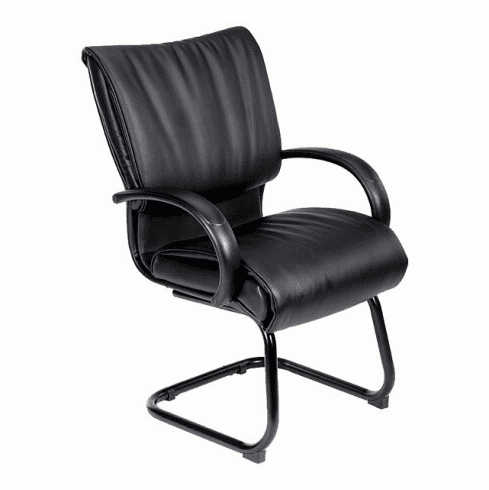 This leather visitor chair normally ships within 2-3 business days from our GA or CA warehouse.